Warned about the responsibility of the first part of Art. 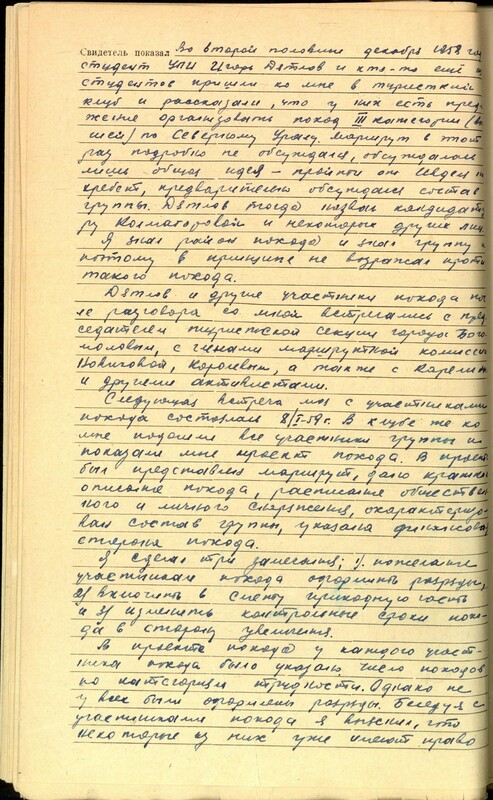 92 of the RSFSR Criminal Code for refusing to testify and under Art. 95 RSFSR Criminal Code for knowingly giving false testimony. 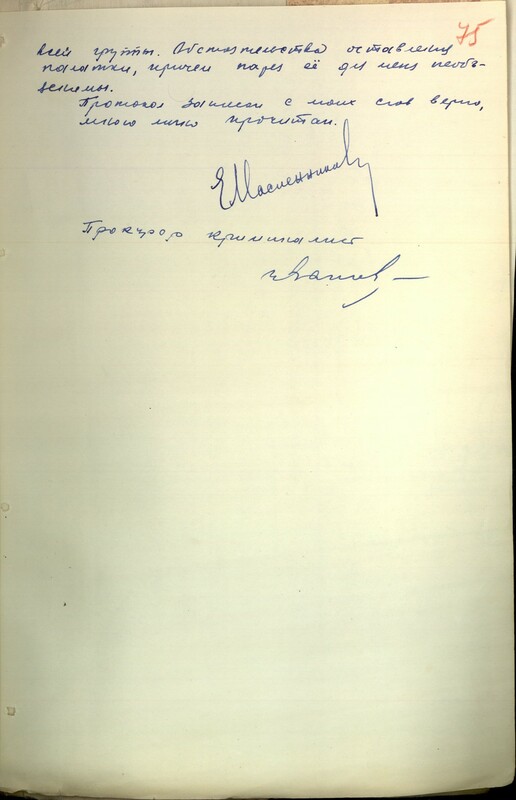 Signature. 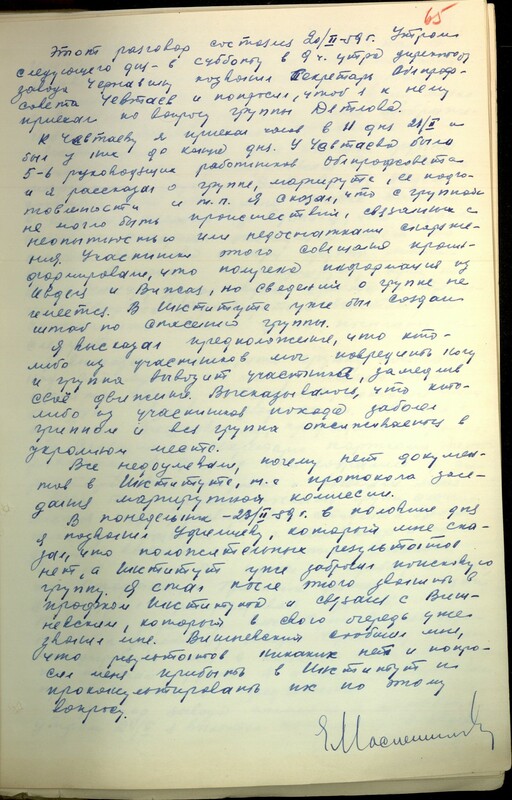 The witness testified: In the second half of December of 1958 UPI student Igor Dyatlov and someone else of the students came to me in the Sports Club and told me that they have a proposal to organize a trek category III (the highest) for the Northern Urals. The route was not discussed in detail at this time, only the general idea - to go from Ivdel to the ridge, started discussing who can join the group. Dyatlov then mentioned Kolmogorova and some other names. I knew the area and knew the members of the group and therefore in principle didn't oppose to such a expedition. after the conversation with me Dyatlov and other members of the group met with the chairman of the sports municipal section Bogomolov, with members of the Route commission Novikova, Korolyov, as well as Karelin and other activists. 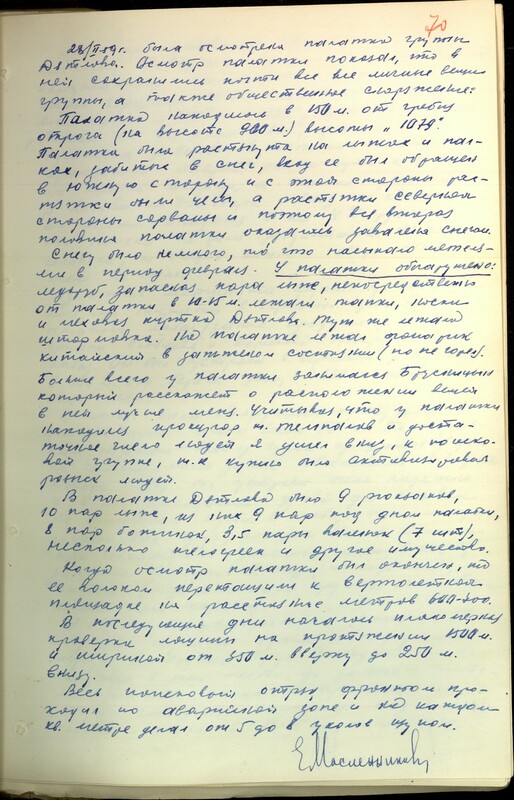 My next meeting with the participants in the expedition took place on 08.01.59 All group members came to me at the club and showed me a plan of the expedition. The project presented the route, a brief description of the expedition, the inventory of public and personal equipment, performance overview of the members of the group, and the budget for the expedition. for a higher rank, but they haven't done it. It was in their interest to assign the correct ranks right away. I don't remember now the ranks of the participants and the corresponding sports category, but then, in the conversation, we clarified this. The fact is that to obtain, for example, 2nd category one must have five campaigns, of which 3 campaigns must be of category 1 and 2 campaigns of category 2. Zina Kolmogorova, for example, had 6 campaigns, including a 4 campaigns of category 2 and 1 campaign of category 3. She already had the right to get a rank 2. This is what my first suggestions to the plan was about. The second point came down to the fact that the cost estimates did not account for the reimbursements. Usually the trade union finances half of the campaign and in this case it was not recorded in the plan. The students also explained to me that part of the expenses will be covered by the trade union - the amount I can not remember. In the estimation of the return dates, the participants in the trek did not make allowances for unforeseen circumstances. There is such an order that the campaign is controlled by a 2-organizations - organizations that finances and directs - sports clubs and controlling organizations - is the city committee for physical culture and sports. 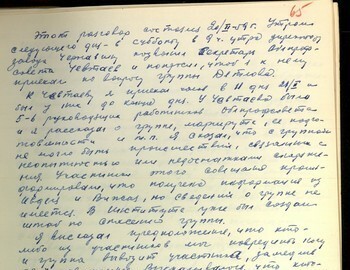 According to their plan, the participants in the expedition were required to report by telegram to the City Committee of the Institute of Physical Education and Sports Club on 26.01.59 from Vizhay about the beginning of the campaign, and on 09.02.59, to same telegram addresses - about the end of the campaign. term specified 28.01 and a second term - 12.02.59 These terms are listed in the Route Commission protocol. My comments on the project were taken into an account and the campaign was approved by the Route Commission, and a protocol is drawn in 3 copies. 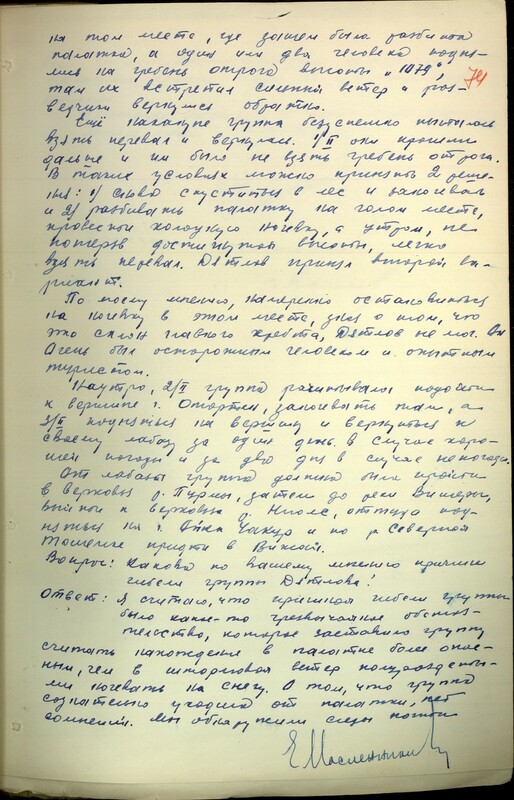 1 copy of the protocol remains in the records of the Route Commission - one in the City Committee of physical education and the leader of the group had to bring the third copy to the Sports club. 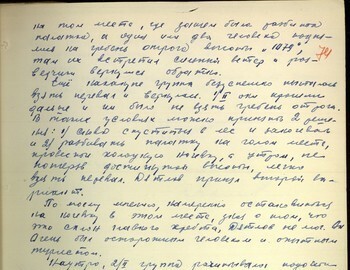 In this case, Dyatlov received the third copy of the protocol, but he didn't bring it to the sports club, and copies 1 and 2 ended were intended. On 20.02.59 Ufimtsev from the City Commette for Physical Education left a message for me to call him urgently. About 3-3.30 pm that day day I called Ufimtsev and he immediately told me that there is no sign of Dyatlov group whose checkpoint date was 12.02, and the the group has not returned. I told him what I knew about the route, because Ufimtsev didn't know much about it. I also said that the route is complicated, but the group is very strong, can not get lost and so the situation must be considered complicated. I asked Ufimtsev on the measures that have been taken and Ufimtsev replied that he contacted the institute employees, but they initially refused to take part on the grounds that the group consisted not only of students but also included Zolotaryov, Slobodin, Krivonischenko, Thibault. Ufimtsev questions boiled down to the matter of who should begin the search and who should lead. I said to Ufimtsev that the organization, which sent the group, i.e. UPI should immediately begin the search. That night I did not go anywhere, was the end of the working day. 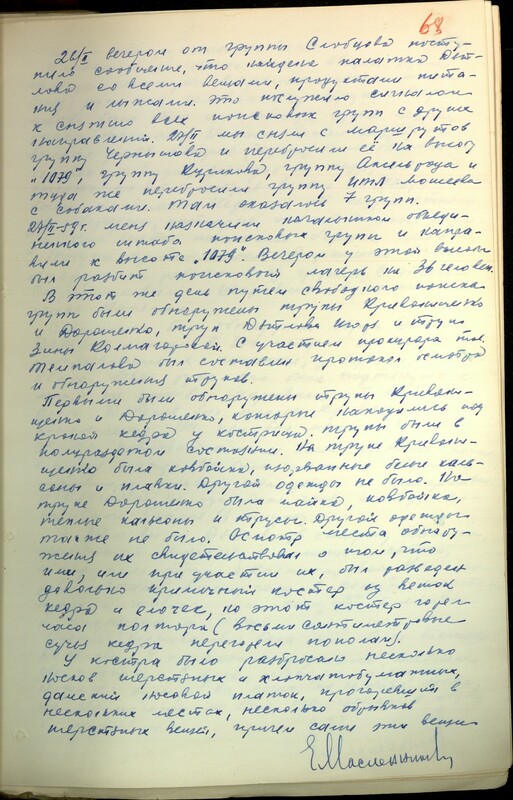 This conversation took place on 02.20.59, the next morning - Saturday at 9 am the Secretary of the Regional Trade Union Council Chevtaev called the director of the plant Chernavin and asked for me to go to him on the matter of Dyatlov group. I arrived to Chevtaev at 11 am on 21.02 and stayed with him till the end of the working day. There were 5-6 executives of the Regional Trade Union Council with Chevtaev and I talked about the group, the itinerary and physical condition, etc. I said that it is very unlikely the group to have had accident related to inexperience or shortcomings of equipment. We ware told that there has been contact with Ivdel and Vizhay, but there is no information about the group. A rescue team has been already created with its Headquarters at the institute. I suggested that any of the hikers could have sustained an injury to the leg, and the group helping the injured member could have slowed its movement. Commented that any of the participants of the group could have caught the flu and the whole group had to hide in a secluded place. All wondered why there are no documents in the Institute, i.e. the protocol from the Route Commission. 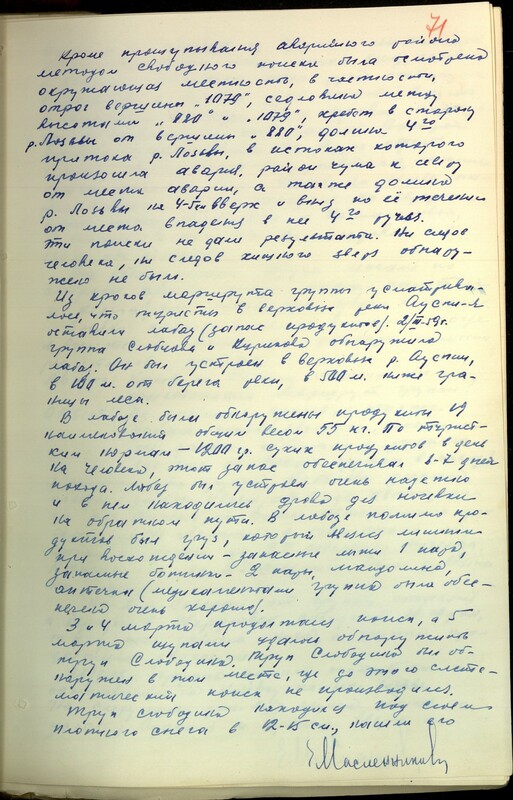 On Monday, 02.23.59, at noon I called Ufimtsev, who told me that are no positive news, and the Institute has sent out a search party. I began then to call in the Trade Union of the Institute and got a hold of Vishnevskiy, who in turn was calling me. 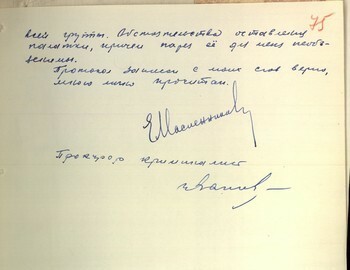 Visnievskiy told me that there are no results, and asked me to come to the Institute and to advise them on this matter. I stayed at the Institute till 12 pm. At the institute I had to tell the whole story again about the details of the preparations of the group, the route, what I think could happen with the group and of my considerations on the organization of research. The Institute had already sent a group of students under the guidance of Slobtsov on the route of Dyatlov group. From Ivdel was reported that they found Dyatlov group overnight campsite in the middle flow of Auspiya river and a group of geologists from the Northern Expedition are going in this direction and three groups of Mansi went out in search of the route: one - on Oyko-Chakur, the other - along the ridge and the third - on Otorten. Institute leaders believed that more search parties should not be sent. I said that on my opinion more groups should be sent out. It is better, I said, that there will be groups of students that search for their comrades, that they might yelled better results. 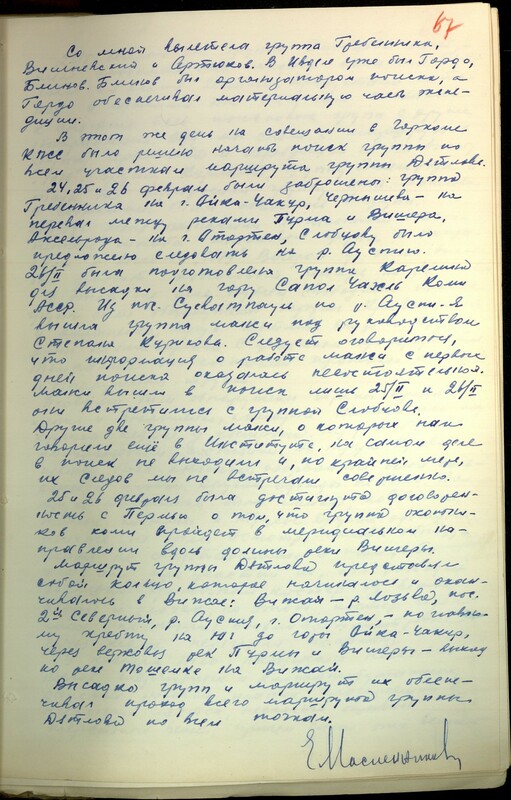 I called the Chairman of the Trade Union Vishnevskiy, the Party secretary Slobodin, and the Secretary of the UPI party committee Zaostrovskiy. At 9 am they gathered at the Institute's Director. And they called for me. 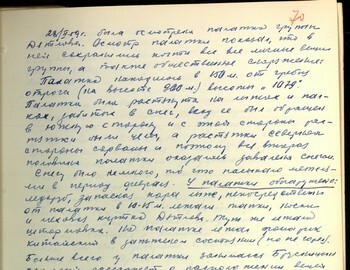 It was decided to send a group of climbers led by student Grebennik for the exploration of Mt. 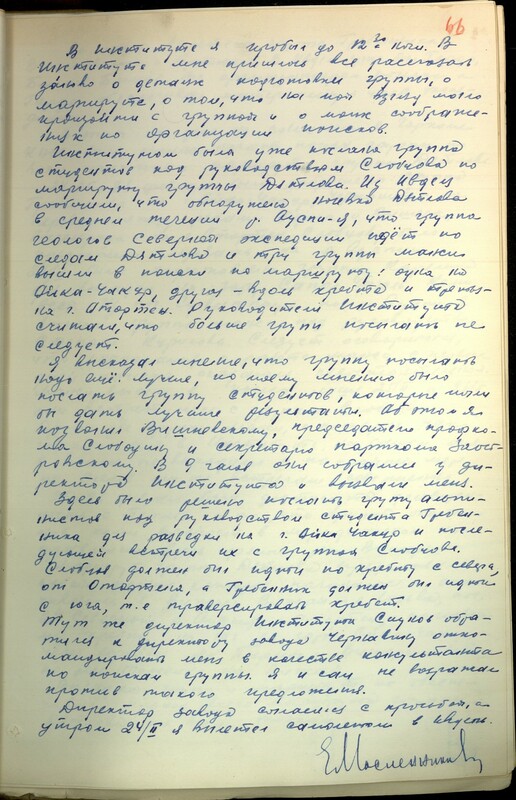 Oyko-Chakur and a subsequent meeting with Slobtsov group. Slobtsov had to hike along the ridge to the north of Otorten and Grebennik had to go to the south, that is, traversing the ridge. Then director of the Institute Siunov turned to the director of the plant Chernavin to loan me as a consultant for the search group. I was not opposed to such a proposal. Plant director agreed to the request, and on 24.02 morning, I flew on a plane to Ivdel. With me flew Grebennik group, Visnievskiy and Ortyukov. Gordo and Blinov were already in Ivdel. 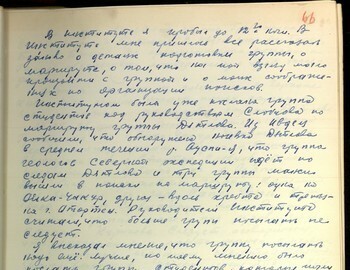 Blinov was in charge of organizing the search and Gordo secured the financial aspect of the expedition. On the same day at a meeting in the City Party Committee, it was decided to broaden the searching in all areas of Dyatlov group route. 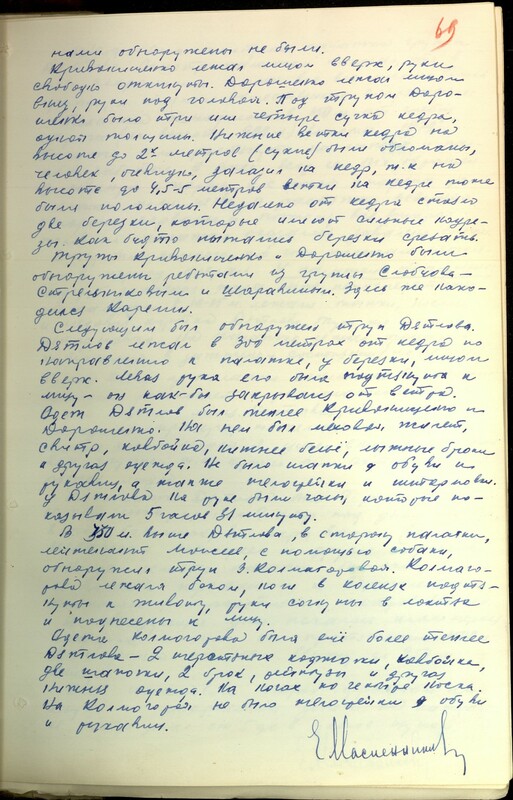 24, 25 and 26 February groups have been dropped off: Grebennik group on Oyko-Chakur, Chernyshov - on the pass between the rivers Purma and Vishera, Akselrod - on Otorten. Slobtsov was decided to follow Auspiya river. 26.02 Karelin group was prepared for landing on mountain Sapol Syakhl Komi ASSR. Mansi group led by Stepan Kurikov went out on a search from the village of Suevatpaul on Auspiya river. It should be noted that the information from the first days of search of Mansi was untenable. Mansi started searching only on 25.02 and on 26.02 they met with Slobtsov group. The other two Mansi groups that we heard about back in the Institute, in fact, did not go out on a search or at least we didn't see any trace of them. On 25 and 26 of February an agreement was reached with Perm that a group of Komi hunters will start in north-south direction along the valley of the Vishera river. Dyatlov group intended a route that started and circled back in Vizhay: Vizhay - Lozva river, 2nd North mine settlement, Auspiya river, Mt. Otorten - going south on the main ridge, to the mountains Oyko-Chakur through the upper sources of rivers Purma and Vishera - exit via Toshemka river in Vizhay. 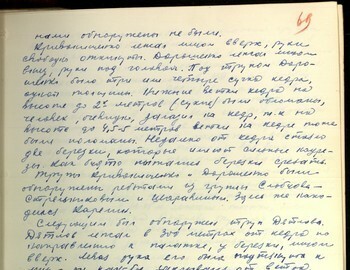 The landing points of the search groups provided passages to all parts of Dyatlov group intended route. 26.02 in the evening a report was received from Slobtsov that Dyatlov group tent was found with all the items, food and skis. This was a signal to withdraw all the search groups from the other areas. 27.02 we took off their route Chernyshov group and transferred them to height "1079", Kurikov group, Akselrod group and ITL group of Moiseev with the dogs. There turned out to be 7 groups. 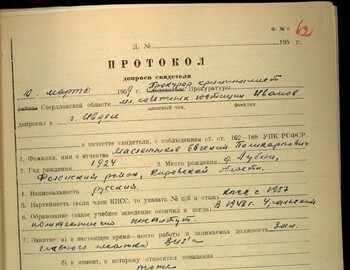 27.02.59 I was appointed Chief of Joint Staff of the search teams and sent to height "1079". In the evening of the same day a search base camp for 36 members was setup on the same area. On the same day while searching the general area the bodies of Doroshenko and Krivonischenko were found, the body of Igor Dyatlov and the body of Zina Kolmogorova. With the participation of comrade prosecutor Tempalov an inspection protocol was drawn up about the scene where the bodies were discovered. The first bodies of Krivonischenko and Doroshenko were found under the crown of a cedar cedar tree near a makeshift campfire. The bodies were in a half-naked state. On Krivonischenko's body was checked shirt, torn white underpants and trunks. No other clothing. On Doroshenko's body was shirt, checked shirt, padded pants and shorts. No other clothing as well. Inspection detected that they or in their presence was lit a pretty decent fire of cedar and fir-trees branches, but the fire was burning for hour and a half (80 cm cedar boughs burned in half). 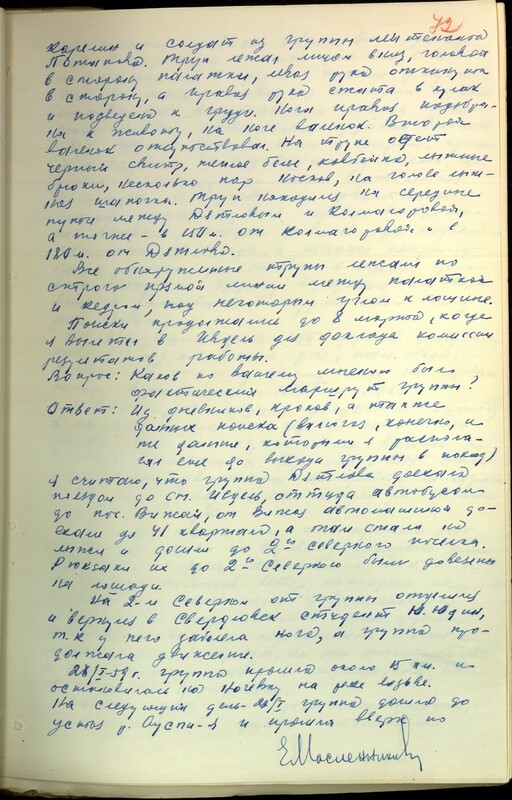 Krivonischenko was lying face up, arms freely swiveled. Doroshenko was lying face down, hands under his head. 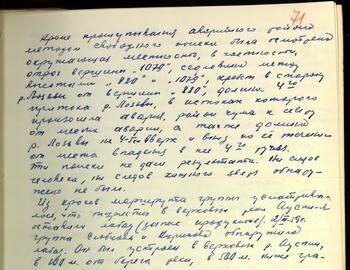 Under Doroshenko's body there were three or four cedar branches of same thickness. Lower cedar branches at a height of up to 2 meters (dry), were broken off, someone obviously climbed on the cedar, because at a height of 4.5 - 5 m branches on the cedar were also broken. Not far from the cedar were two birch trees, which have prominent cuts as if someone tried to cut the birch. Krivonischenko and Doroshenko bodies were found by members of Slobtsov group - Strelnikov and Sharavin. Karelin was also there. Next to be found dead was Dyatlov. 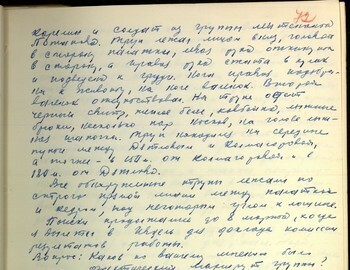 Dyatlov was lying 300 m from the cedar tree toward the tent, in a small birch, face up. His left hand was covering the face - he seems to be fending against the wind. Dyatlov was dressed warmer than Krivonischenko and Doroshenko. He was wearing a fur vest, sweater, checked shirt, shorts, ski pants and other clothing. He didn't wear hat, shoes and gloves, as well as undershirt and jacket. On his hand Dyatlov was wearing a wristwatch that stopped at 5:31. 350 m from Dyatlov uphill toward the tent, Lt. Moiseev with the help of the dogs found the body of Z. Kolmogorova. Kolmogorova was lying sideways, knees pulled up to her stomach, arms bent at the elbows and held up to her face. 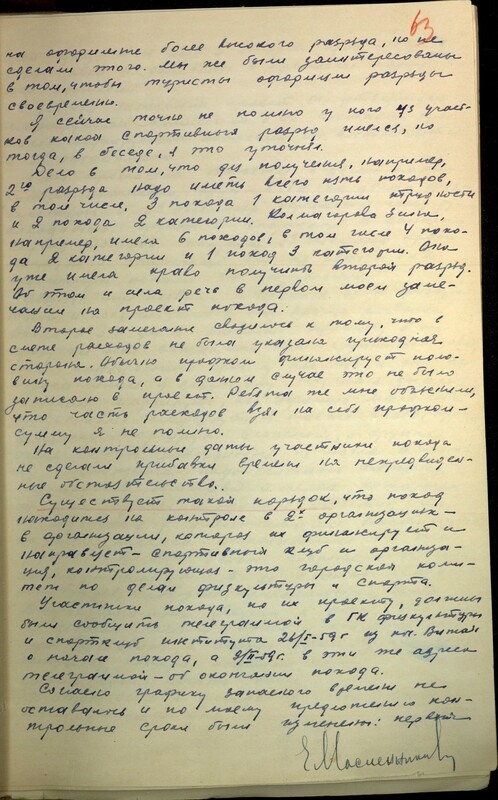 Kolmogorova was dressed better than Dyatlov - 2 woolen undershirts, checked shirt, two caps, 2 trousers, leggings and other underwear. Four socks on her feet. Kolmogorova didn't have jacket, shoes or gloves. 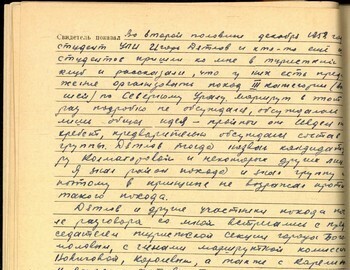 28.2.59 Dyatlov group tent was examined. Tent inspection showed that almost all personal belongings of the members, as well as the university equipment was present. The tent was 150 m from the spur ridge (900 m) of height "1079". The tent was stretched out on skis and poles, hammered into the snow, its entrance facing the south side and on that side extensions were intact, and the north side stretching was disrupted and therefore the entire second half of the tent was covered with snow. The snow was not much, only drifted by the blizzards in the period of February. Items found in the tent: ice ax, a spare pair of ski, 10-15 m from the tent were found sneakers, socks and Dyatlov fur jacket. Also a storm jacket. On top of the tent was laying Chinese flashlight turned on (but unlit). 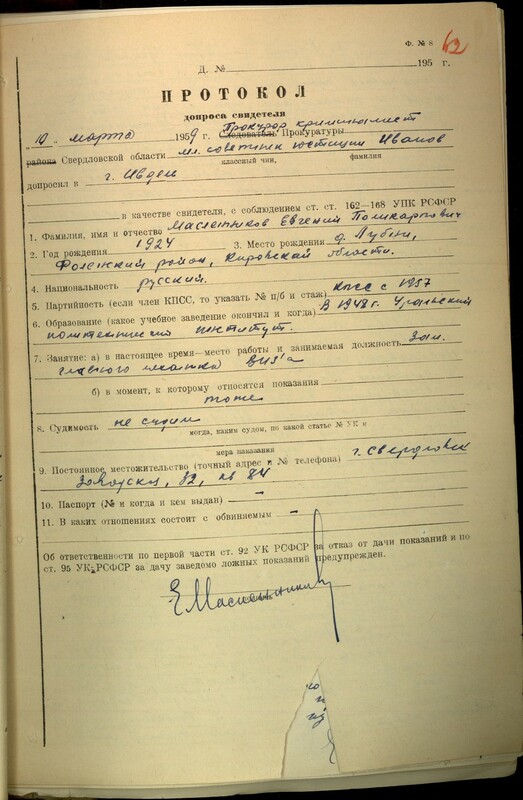 With the tent was mostly engaged Brusnitsyn, who can describe how the items were found better than me. Considering that prosecutor Tempalov and sufficient number of people were at the tent I went down to the search base camp, as it was necessary to organize the search of the remaining hikers. In Dyatlov tent there were 9 backpacks, 10 pairs of skis, of which 9 pairs under the bottom of the tent, 8 pairs of shoes, 3,5 pairs of felt boots (7 pcs. ), several padded jackets, and other property. When the inspection was over we dragged the tent to the helipad at a distance of 600-700. In the following days we began to systematically search the ravine over 1500 m going 350 m uphill to 250 m downhill. The search party lined up passed through the search zone and each meter made from 5 to 8 inserts with the probes. 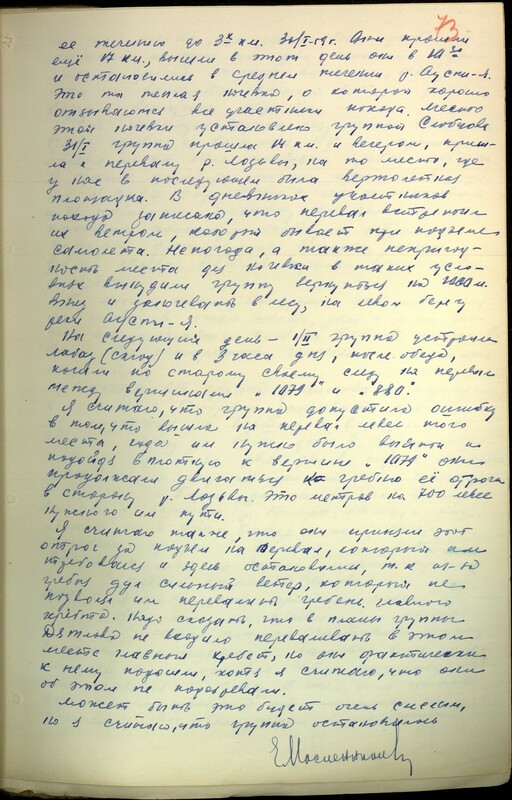 Besides probing the search area the surroundings were examined by free general search, in particular the pass between heights "880" and "1079", the valley of 4th tributary to Lozva river, in whose origins occurred the accident, the area of the chum north of the site of the accident, as well as Lozva river valley 4-5 km up and down the river from its confluence with the 4th tributary. These searches yielded no results. No traces of man or beast were found. In the maps of the route of the group it is marked that the hikers left cache of products (labaz) in the upper sources of Auspiya river. 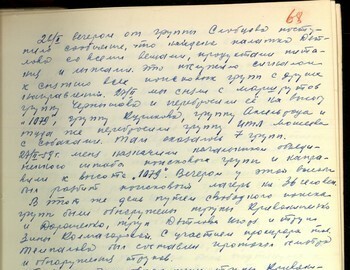 On 2 March 1959 the group of Kurikov and Slobtsov found the storage site. It was constructed in the upper Auspiya river, 100 m from the river bank, 500 meters below the end of the forest. 19 types of products weighing 55 kg were found in the storage. According to the hiking standards - 1200 g dry food per person per day, this stock could sustain 6-7 days trip. Labaz was built very safe and there wes wood for an overnight stay on the way back. In addition to the food supplies in the storage was left cargo superfluous when climbing - one pair of ski, 2 pairs of shoes, mandolin, first aid kit (the group was provided with medicines very well). Karelin and soldiers from Lieutenant Potapov group. The body was lying face down, head in the direction of the tent, the left hand was folded to the side, while the right hand is clenched in a fist and is brought to the chest. Right foot is bent to the abdomen, felt boot on the foot. Second boot is absent. On the body there was black sweater, warm underwear, checked shirt, ski pants, a few pairs of socks, ski cap on the head. The body was in the middle between Dyatlov and Kolmogorova, more precisely - 150 m from Kolmogorova and 180 m from Dyatlov. All the bodies were found on a straight line between the cedar and the tent, at a certain angle to the ravine. The search continued until March 8, when I flew back to Ivdel to report the results to the commission. Question: What in your opinion was the actual route of the group? 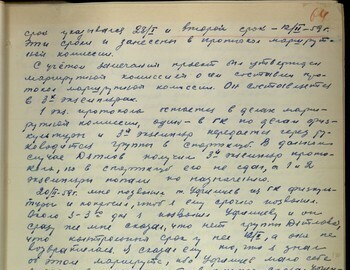 Answer: From the diaries, handmade maps, as well as the search results (including, of course, the information I had prior of the beginning of the trek) I think that Dyatlov group took a train to Ivdel, from there went by bus to Vizhay, from Vizhay they arrived by truck to 41 quarters, and from there skiing they reached the 2nd North village. Their backpacks were transported to the 2nd North on a horse sledge. 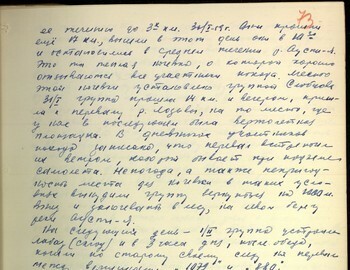 At the 2nd North student Y. Yudin separated from the group and returned to Sverdlovsk due to pain in his leg, and the group continued its advancement. 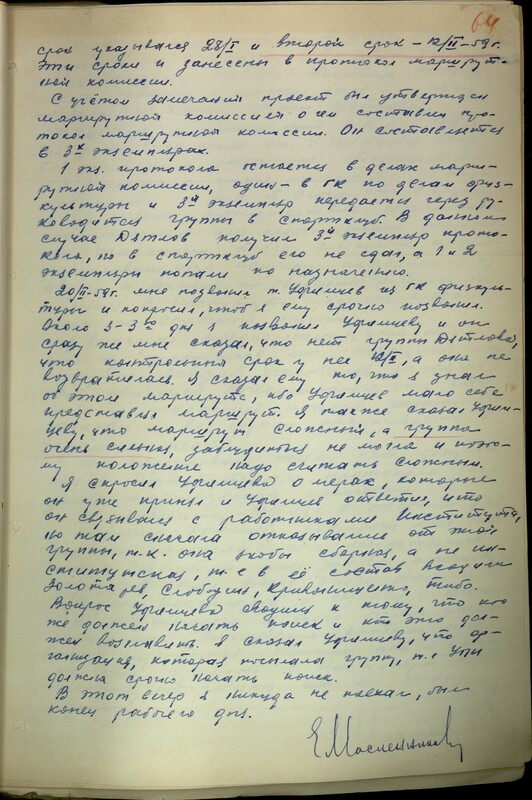 28.01.59, the group covered about 15 km and stopped for the night on Lozva river. 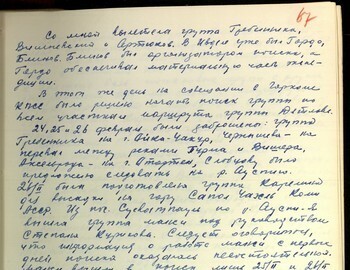 30.01.59, they walked 17 km that day starting at 10.30. This is the warm overnight, which all the participants of the expedition respond well. The campsite of this night was found by Slobtsov group. 31.01 the group walked 14 km and in the evening came to the Lozva river pass, to the place where we later had a helipad. The diaries of participants of the trek say that the pass met them with wind, similar to which happens on aircraft takeoff. Bad weather and the unsuitability of the place to spend the night in such conditions forced the group to return 1000 m down and spend the night in the woods, on the left bank of Auspiya river. The next day - 1.02 the group built a storage shed (labaz) and at 3 pm, after lunch, went on the old trail to the pass between the peaks of "1079" and "880". I believe that the group made a mistake when they went to the pass drifting to the left of the intended route and going straight to the top of the "1079" they proceeded to the crest of the ridge moving on the side of Lozva river. This took them 700 m to the left of where they should be. I also believe that they have taken the spur to climb to the pass they needed and stayed there because strong wind was blowing from behind the ridge, which did not allow them to cross the crest of the main ridge. I must say that Dyatlov group did not intend to cross at this point the main ridge, but they actually came up to it, although I believe that they did not know about it. at the place where later the tent was destroyed, and one or two men climbed to the edge of the ridge to height "1079", where they were met by a strong wind and the scouts returned. On the eve of the group they tried unsuccessfully to cross the pass and returned. 2) break up a tent on a bare spot and spend a cold night and in the morning, without losing altitude, easy take the pass. Dyatlov took the second option. In my opinion, if Dyatlov knew that this is the slope of the main ridge he wouldn't have stayed the night in this place. He was a very careful man, and experienced hiker. The next morning, 2.02 the group expected to go up Mt. Otorten, spend the night there, and on the 3.02 climb the summit and return to the labaz all in one day if the weather permits, or two days in case of bad weather. From the labaz the group had to go to the upper Purma river, then to Vishera river, go to the upper sources of Nyols river, and from there up to Mt. Oyko-Chakur and along North Toshemka river come to Vizhay. Question: What are in your opinion the cause of death of Dyatlov group? the whole group. The circumstances of the abandonment of the tent, and cutting it for me are inexplicable.